AAR for White Star Rising. Scenario 1 - Noville, Belgium. In this scenario, American forces (507th Para and CCA) are defending the town of Ste. Jeanne and surrounding area. 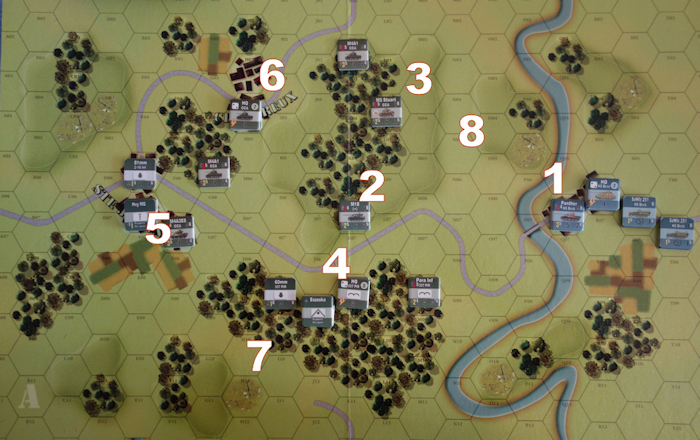 Kampfgruppe Beck (all located to the west of the river) must cross the river and capture all 3 hexes of Ste. Jeanne before the end of turn 8. Beck have a detachment off board that will enter play via a road hex on either the north, south or west edge of the board, randomly determined by a die roll. I have played the scenario several times and have never had a German success. The time table is tight and I have generally thrust down the central road and taken very heavy casualties without ever putting Ste. Jeanne under serious threat. For this playing, I decided to do something quite different with the Germans. 1. KG Beck can only cross the river at the bridge, (their objective is 5). 2. The M18 is in wooded hill to get some early shots off at the bridge crossing. 3. The Stuart is in an ambush position. 4. Bazooka and 57mm A/T units are at this choke point covering the road. 5. The Easy Eight and Infantry (with HMG) are in Ste. Jeanne. 6. The CCA HQ and an infantry platoon are blocking approaches from the North. 7. The 507th Para can quickly move to defend into the lower half of the wood to cover this area from a southern arrival of the German reinforcing detachment. 8. This valley type feature will be the northerly route that KG Beck takes. The road is a natural bottleneck and subject to ambush. It is heavily guarded by the M18, Bazooka team and 57mm platoon. The Stuart has a weak gun, but from it’s hidden position, it can opportunity fire as soon as an enemy climbs onto the hill and moves next to it. It will get a modifier for close range fire that will help it. It may deter the Germans from trying to make a short-cut into the woods. KG Beck - The Panthers lead followed by two platoons of Pz1V and three platoons of Panzer grenadiers (plus a HMG) which are half track mounted. The Pz1V’s are slower moving. The off board detachment has a platoon each of Tigers, Stug III’s and infantry. The CCA have two platoons of M4A1 and one platoon of the effective Easy Eight Shermans with the 76mm gun, together with infantry and 81mm mortars. Since the German objective is Ste. Jeanne, the Easy Eight platoon and an armoured infantry platoon, supplemented by machine guns, hold the lower part of the town in readiness of the expected difficult firefight for the town. The 81mm mortar section occupies the top part of the town and will rely on the HQ (in the above town of Chatereux) for spotting. Beck - Make a surprise move by crossing the bridge and swinging north, moving at full speed and travelling along the low ground to stay concealed. The M18 fires, no effect. 507th - HQ calls down mortar fire onto the half tracks without effect. Others stay in place in case the Germans suddenly change direction. The M18 drops down off the hill and fires at a PzIV platoon and disrupts it. End Turn marker (number 2), so CCA did not get to activate. 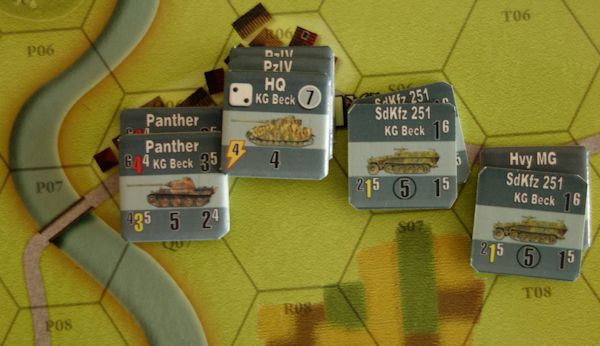 Beck - The disrupted PzIV rallies and engages the M18, scoring 3 hits and destroying the platoon. The rest of the formation continue around the top of the hill, led by Panthers. The M4A1 Sherman at the top fires opportunity fire at point blank range, it hits but does not penetrate. The faster half tracks push past the other PzIV platoon. 507th - The 57mm fires at the PzIV (that destroyed the M18) and scores two sixes. The PzIV manages to negate 1 on armour saves but it still has to take a disrupt for the other hit. The rest of the formation start to move westwards through the woods. CCA - Though the direction of the main German assault is now known, the arrival point of Group B is not. American units need to stay in position to counter this threat. The HQ calls 81mm mortar fire onto the panthers without effect. The troops juggle around a little. The M4A1 at the top of the map pulls back further into the woods and infantry move into the northern end of Chatereux and an M4A1 platoon move into the south of the town. The stuart M5 platoon stays in place, ready to ambush any stray German infantry. CCA - 81’s fire, again no effect. Nothing else activates so that it can stay fresh for opportunity fire. 507th - They still have to cover the southern approach against the potential arrival of the German group B. The 57mm A/T gun continues to fire at the disrupted PzIV without luck even though assisted by the HQ. Beck - The Pz IV (just above the dice) fails to rally. 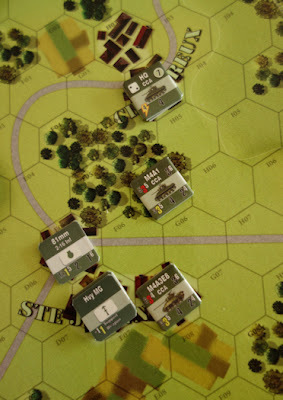 The Germans again surprise the American player, instead of continuing the advance down the road towards Chatereux, they climb the hill and push into the woods. The two M4A1 platoons from within the woods and at the south end of Chatereux fire but the Panther armour deflects the hits. The half tracks move to the top of the woods and then the infantry dismount (I wrongly fired mortars at this point - which cannot opportunity fire). The second Pz IV platoon and the HQ take to the hill for a short cut across the woods and are hit by the Stuart M5. The PzIV takes a disruption but the HQ survives the attack. 507th - The 57mm loads up and moves out onto the road. A para platoon leaves the woods and crosses to the single woods hex (bottom left of above photo) in anticipation of ‘B’ group arriving on the southern road. Beck - activates and decides it’s time to bring on the detachment, a die is rolled and the entry point becomes the northern road (top centre of map) and so they join the rest of Beck. One PzIV platoon fails to rally but the other does. Beck are well placed to launch a substantial attack. The U.S. lose the M5 and M4A1 platoons to close fire. The Tiger / Stug III / Infantry detachment move into and around the small wood above Chantereux. CCA - Fire but not effective. Game Turn 5 ….. The Chaos chit is added to the cup. 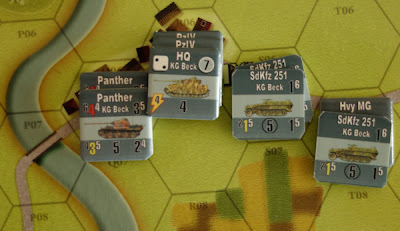 CCA - Engage in firefights, 1 panther platoon is disrupted. The armoured infantry, HMG and Easy Eight stay in Ste. Jeanne, hoping that the northern perimeter can delay the Germans long enough, that the scenario will end before the town can be taken. Beck - Neither the panther or PzIV rallies. The Tiger with infantry start to skirt around American positions at Chatereux, intending to drop down directly onto Ste. Jeanne. 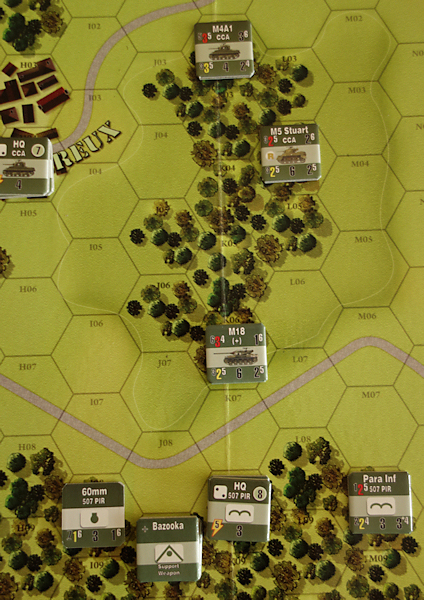 Two panzer grenadier platoons leave the woods and assault the southern end of Chatereux. 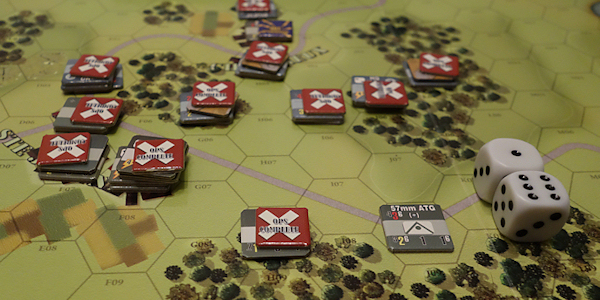 The sides score two hits each, leaving the Germans disrupted and retreating 1 hex, Considering the strength of the attacks, the Americans have done well to maintain the northern perimeter. End Turn marker (number 2) - meaning that the 507th fail to activate this turn. That is bad news for the American player as their presence is needed in and around Ste. Jeanne. 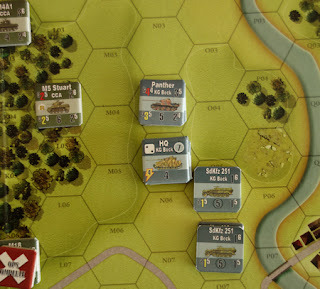 Beck - The American player can only sigh as both German infantry units rally, as does the panther, though one of the PzIV platoons remains stubbornly disrupted. The infantry once again assault the sherman and HQ at Chatereux (this time I remember to apply the infantry bonus in cities rule). The sherman is eliminated and the HQ removed. The tigers and infantry reach the top end of Ste. Jeanne. Panzer grenadiers have inflitrated into the woods between the two towns and the two panther platoons exit the wood edge on the hill and take position on the high ground over-looking the eastern side of Chatereux. There is every prospect that the Americans are going to be simply overwhelmed. Chaos marker - the Allies get a P-47 ground attack aircraft added to the chit cup for this turn only. P-47 - The air unit is drawn. It attacks the tiger stack north of Chatereux but unfortunately it goes wrong and the American 81mm mortar unit in the north of the town is hit instead by friendly fire and is removed from play. The CCA HQ is returned (flipped) and placed with the Easy Eight platoon. CCA - The infantry in Chaterneux are now isolated, they check for command and fail. The defenders at Ste. 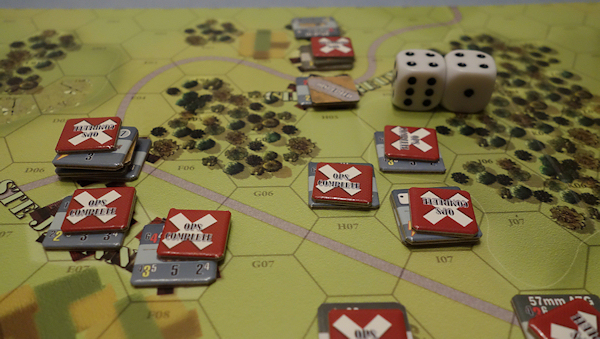 Jeanne fire, but the panther armour survives the hits and German infantry in the woods survive small arms fire. 507th - They move at best speed towards Ste. Jeanne. The 57mm A/T gun simply deploys on the road to catch any German units that advance into the open to assault the town. CCA - The American player pays two fate points to return the CCA formation marker to the chit cup. 507th - A platoon with bazooka manage to get around Ste. Jeanne and occupy the northern town hex - facing the tiger detachment. A second platoon enters the southern part. End Turn marker (number 1). Chaos marker (8 rolled) - An allied leader is placed in Chatereux, giving direct command to the isolated infantry platoon. CCA - The now officer led platoon in Chatereux assaults the adjacent lone (and poorly placed) Stug III and disrupts it. Nothing else acts, choosing instead to hold it’s fire for opportunity shots against the inevitable assault on Ste. Jeanne. Beck - At last that PzIV platoon rallies but the Stug III does not. The tigers with their accompanying infantry assault into the town against the paras and both sides suffer two hits. The Germans are disrupted and fall back but the defenders disrupt and also flip. Panther fire destroys the Easy Eight Shermans, leaving the town without armour. An advancing PzIV platoon is hit and disrupted by opportunity fire from the well sited 57mm A/T gun. The fires from the Germans and further opportunity fire from the Americans cause several disruption results to both sides as the firefight intensifies. Game Turn 8 (final turn). The CCA HQ cannot be returned to play, so all remaining CCA unless leader led (i.e. the unit in Chatereux) will be out of command and need to test individually. End Turn marker (number 1) - Cruel timing for the German player and a ray of hope for the American player. Chaos Marker (8 rolled) - Another allied leader is created, just in time, this will be useful in Ste. Jeanne. CCA - Just to prove what exciting twists of fate this game can bring, the officer led unit (with HMG support) in Ste. Jeanne (just created above) fires on a German platoon that also has HMG support, resulting in 4 hits and the removal of that unit. The bazooka armed unit facing the tiger fails to get into command and so unfortunately can only opportunity fire. Beck - Most of the force rallies and importantly, that includes the tiger stack. They assault into the northern end of the town and take the hex. Tank fire clears the southern end and a panther platoon edges into that hex. There is only one unit left that the Germans can use and they must capture the centre of the town to win. 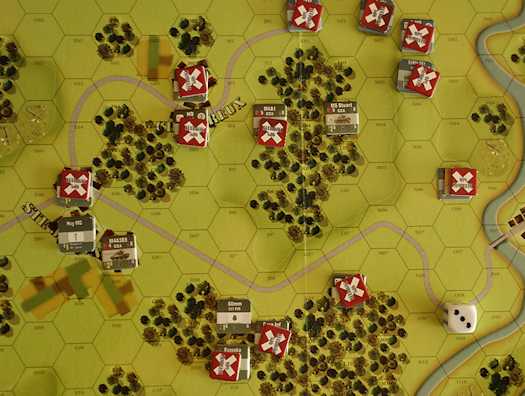 The lone panzer grenadier leaves the cover of the woods to assault the town. The defending unit is disrupted and so cannot opportunity fire and there is nothing else around that can try to stop the German unit. During the assault, the defenders inflict one hit but the attackers inflict two and take the hex. Ste. Jeanne falls to the Germans on quite literally the last die roll - what a brilliant conclusion to this game. EDIT - just noticed that I wrongly kept the Chaos marker in the game beyond the turn that it was first drawn. Wish I had caught you before you started your blog! I would have loved to have you posting and publishing at The Big Board! Great AAR, shared with all and sundry. Thank you both. WSR is a good game to start a first post, it is a real 'players game'. Thank's for the comment re Big Board, a fine compliment indeed.